Here is a list of the fishing options on the world famous Kenai River, home of the world record King Salmon caught by Les Anderson in May 1985, weighing in at an incredible 97 pounds 4 ounces! Indeed ?? of the top 10 king salmon were caught on the Kenai. 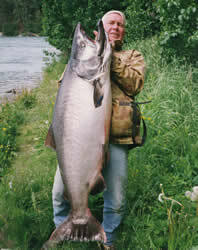 King Salmon (May 15-July 31): These are the fish that made the Kenai River famous. The average weight is from 30-60 pounds. Many are taken each season over 70 pounds! The Kenai is unique in that it has two overlapping runs of kings beginning in mid May through the season end on July 31. 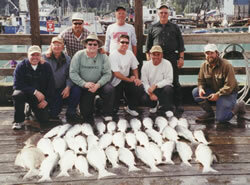 These fish are a thrill to hook into and something every fisherperson should experience. Sockeye (June 10-August 10): The Kenai River boasts two large runs of sockeye, entering the river along with the kings in early June and again in July. Locally referred to as "Reds", these fish are considered to be the finest eating of all salmon. They are ocean fresh and provide our guests with some gerat after-hours excitement. They are also know for their tremendous fight. Indeed, pound for pound are probably the strongest salmon to hit the Kenai. Coho (August 1- October 31): August brings a change of tactics with the arrival of the hard-fighting, fine-eating silvers. Ranging in weight from 8-20 pound, they provide great action well into October. On even numbered years they are joined by huge numbers of pink salmon, better known as "Humpies". These fish are so plentiful, it's hard not to catch them. Rainbow Trout/Dolly Varden (June 15-October 31): The Kenai River is home to a large number of rainbow trout and dolly varden. The popularity of this fishery has grow in recent years, and has become a favorite of Alaska resident anglers. 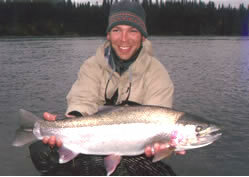 It is not uncommon to find rainbow trout over 30 inches with smaler rainbows and dollies providing steady action. We lighten our gear when targeting resident species, making it both fun and challenging. Our trout trips are all catch and release. Fiberglass reproductions of these trout are available using photos and measurements taken prior to release. If you like to catch trout but taking home some table fare is important, consider coming in the fall when we can target both trout and silvers on the same trip.